Power MOSFETs are widely used in switch mode applications such as pulse width modulated electrical motor controllers and switching mode power supplies. While they are also routinely used in linear mode applications such as power amplifiers and linear power supplies, standard MOSFETs are prone to secondary breakdowns due to hot-spotting or current focusing when operated in linear mode. 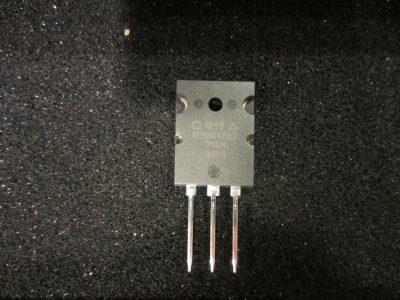 In fact, many of the power MOSFETs such as the popular IRFP150N do not include DC operation characteristics in its FBSOA(Forward Bias Safe Operating Area, or simply SOA) specifications. While operating in current-saturated region the drain to source on-resistance (Rdson) exhibits temperature coefficient which allows easy current sharing among many paralleled devices, when operating in linear region however, Ids (drain-to-source current) tends to increase due to the negative tempco of the gate threshold voltage below the zero temperature coefficient point. This in turn further increases the die temperature and without negative feedback, this leads to hot-spotting or current focusing (thermal runaway) and eventually the destruction of the device. For this reason, the number of paralleled MOSFETs are typically over-provisioned to ensure that each individual MOSFET operates well within its SOA boundary. The above described limitations are analyzed in detail in this application note (AN-4161) and also documented here. For example, the electronic load I built a few years ago used six MOSFETs in parallel and achieved a maximum power dissipation of 200W. I tested a few of the IRFP150N’s individually in linear mode and they all failed when the power dissipation reached between 45W to 60W. There is a class of so called linear MOSFET (e.g. 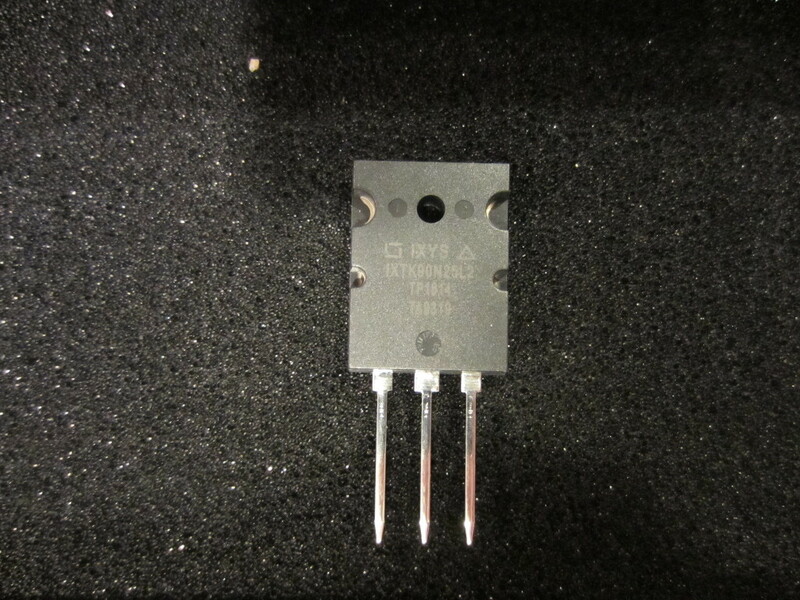 IXYS‘ Linear L2™ MOSFETs) which is specifically designed to operate in linear region with an extended FBSOA. So in theory, they would be perfect for using in an electronic dummy load. To find out how well these linear MOSFETs would perform I decided to purchase a couple of IXTK90N25L2‘s (they are quite pricey) and perform a few tests. IXTK90N25L2 comes in TO-264 packaging. It has a Vdss of 250V and Id of 90A. It has a 575W SOA power dissipation rating (this is for pulsed operation, for continuous operation the maximum Pd is limited by the junction temperature). Realistically, due to the thermal resistance of the packaging (RthJC + RthCS = 0.13+0.15 °C/W) and the additional thermal resistance from thermal grease and heatsink the maximum power a single TO-264 device can dissipate is likely just around 250W. The circuit I used to drive the MOSFET is largely the same as what I used previously. But since I wanted to be able to sink large current (tens of Amps), I used a 50A/75mV current shunt as the current sensing resistor. Since the voltage drop across the shunt resistor is very small (1.5mv/A) a low input offset, rail-to-rail OpAmp is necessary to ensure accurate current setting. Among the OpAmps I have, LT1636 seems to be a good choice as it is rail-to-rail, has low input offset and has a wide Vcc range. 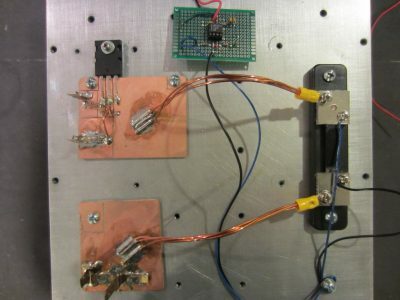 The test circuit is shown below. The control voltage comes from my EDC/Krohn-Hite MV216A DC Voltage Standard. Correction, the shunt resistor value R3 in the schematic should be 1.5 mΩ not 75 mΩ. It is a 75mV 50A shunt. And the picture below shows the experiment setup. I mounted the MOSFET on a large aluminum heatsink block. The surface of the block is not as polished as the one I used in my previous electronic load build, this will likely affect the maximum power dissipation a bit. Nevertheless, it’s largest heatsink I have on hand. The wires connecting the current shunt are three 14 AWG copper wires paralleled together which should allow carrying at least 60A of current. In the video below, you will see my experiments in detail. First, I tested the load using a 15V 10A power supply and I was able to sink 150W continuously and the case temperature rose to about 90°C. Then I tested a switching power supply and was able to sink more than 55A from its 3.3 rail. These results are quite impressive considering this is with just a single MOSFET. 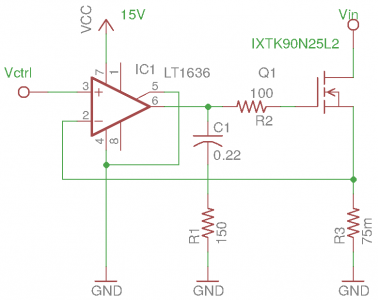 So clearly, IXTK90N25L2 is an excellent choice for building high power electronic load. Although these linear MOSFETs are expensive, using them in an electronic load can reduce circuit complexity as fewer is needed to achieve the same power sinking capability, and at the same time increase reliability due to their guaranteed FBSOA. When I find a suitable copper heatsink I will do the same tests again and I think it can sink at least 50 more watts given lower heatsink thermal resistance. You mentioned that the standard MOSFETs failed at about 45W to 60W. If my requirement of load is only upto 2A @ 12V (24W) will standard MOSFETs suffice for my design or there is some drawback? because linear MOSFETs are lot costlier than standard ones. ^^ Sorry, I meant power MOSFETs instead of standard MOSFETs. You can use a couple of MOSFETs (e.g. IRFP150N) in parallel and they should be able to handle up to 60W. Thank you so much for this huge ammount of usefull Stuff on your Website! It’s always a pleasure to read. I have a few questions about this design. First question: which current shunt are you using? I was searching a lot on digikey for one like this with propper screw terminals and low resistance as yours is. My next question is: Could by maybe watercooling with a copper waterblock the performance be increased by a significant ammount? I guess I have to do some calculations to see where the limit is set by the RthJC & RthCS. I plan to build a load thats capable of sinking 1kw continious. So thermal performance is quite important. And my last question: Do you think paralleling 4 or more of these Mosfets could lead to thermal runaway or other problems as described on power mosfets? The current shunts I used those cheap eBay 50A 75mV ones. I’d think water cooling would achieve better results, but I haven’t tried. Regarding parallel MOSFETs, if you drive each individually like I did (each has its own sensing resistors) then it should not be a problem. thank you much for such a great effort. I want to develop an electronic load with variable current. I am using an arduino with bultin DAC. I have a question that what does the rail-to-rail mean? and why LT1636 is preferred over LM324. And if my control voltage is from the arduino DAC with the voltage range of 0.55 V to 2.75 V. and then I want to use an op-amp to amplify this voltage equal to or greater than Vgs(th) to control the load current. and the feedback is through the sense resistor to the negative pin of op-amp. In this case which op-amp should i prefer? Many thanks for all the very interesting an useful stuff on here. I’m trying to recreate your design. From looking at the pictures I think there are more components as on the schematics. Near the MOSFET there are two resistors or what looks like some. Could you please explane there purpose and values. On the bord with the LT1636 it even look like there are some diodes near pin 2 and 3…? My problem is that the circuit is not stable, I used a 0.001 Ohm shunt and a INA286AID to amplify the voltage from the shunt by 100, so that the control voltage range is higher and I can use a DAC to drive it. I also tried the same circuit without the INA286 (exactly rebuilding your schema in this post) and using a very low control voltage but this also wasn’t successful. Any hints would be greatly appreciated. Hi Roger, one of the resistors is the 100 Ohm gate resistor (R2), the other one is a 1 Meg resistor (exact value doesn’t matter) I placed between the gate and the source to ensure charges do not build up on the gate. the two back-to-back 1N4148s on the inputs of the opamp was added to protect the input of the opamp. Many thanks for the quick reply. I’m a little step closer now. If I operate the circuit as in your drawing it works very nicely. Unfortunately I don’t own a precision voltage source and I would like to use a DAC to run the load from a microcontroller. If I use the INA286 (IMHO a very nice ic for current shunt voltage amplification) I get oscillation on the gate. The oscillation increases with current (at about 2A it is 500mVpp on top of the 4-5V gate voltage, freq approx 15kHz). 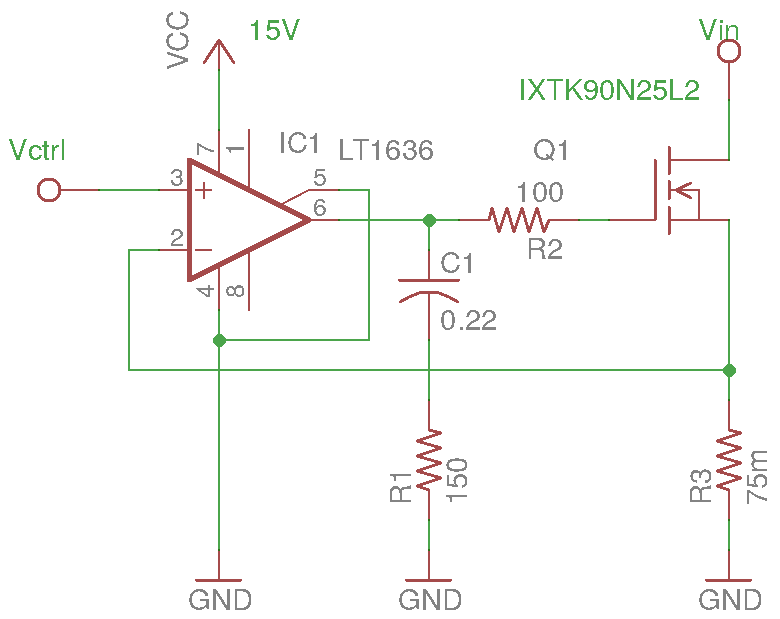 Would you suggest to follow down the route of amplification of the shut voltage or would you go for a precision voltage divider at the output of the DAC? I took a look at the datasheet, INA286 should work fine. Wondering if you could try first power INA286 using a different DC supply to see if there’s any coupling going on. Also, you could try different values in the snubber network (R1, C1) and see if the symptom changes. And increase the gate resistor (R2) also helps clamping down on oscillation, but it also slows down the response time. Hi Roger, given that your shunt resistance is mearly 1 milli-Ohm, the input into the OpAmp is only a few milli-volts when the load is in Amp range. So any coupling would cause the noise to be amplified significantly. Have you measured the waveform at the gate? I wouldn’t be surprised if it’s coupled with mains frequency. Given the low level of signal input, you’d need to keep cross coupling low and signal wires as short as possible. I wouldn’t use a breadboard even for prototyping. Hi Kerry, yes the signal levels are indeed very low and therefore any noise gets amplified a lot. I have measured the signal at the gate the frequency of the oscillation is in the kHz Range but it might be superimposed with mains frequency. I will measure it again bau will be away till the weekend. If you like I’ll send you a screenshot from the scope (how can I reach you) if you have the time and inclination to look at it. Prototyping on a breadboard is clearly not the way to go. I’ll have to rethink it and maybe have a PCB made. Many thanks for your help so far. Another thing you could try before making a PCB is put a few ferrite beads close to the gate of the MOSFET and see if it dampens or eliminates the oscillation. If you saw frequencies in the kHz range, it is usually an indication that there’s parasitic oscillation going on. Typically this kind of circuit needs to see unity gain at DC to prevent oscillation, especially when you are testing mainly power supplies which aren’t exactly transient loads (aka. when your loads are essentially ideal voltage sources). Try bypassing the op-amp with a 0.1uF film cap from the gate of the MOSFET to the inverting (-) input. That should fix any oscillations caused by coupling through the gate->source capacitance. We must do what is called Vctrl ? and 15V is feed volt ?